I’m taking an unpopular stand today, folks, as you’ve probably already guessed from the title of this post. The CW has been getting a lot of flak the last couple of weeks for an upcoming reboot of Louisa May Alcott’s Little Women. It’s been billed as ‘gritty’ and ‘dystopic’, with the girls being changed from sisters to half-sisters and moved from Massachusetts to Philadelphia. In many ways, I can understand the surge of annoyance and outrage from the world of book lovers. Too often, our favorite stories are adapted into movies and television shows and utterly ruined along the way. There are a few examples of books I would never want to see adapted, like The Night Circus. But against all odds, I’m actually in favor of the CW’s Little Women reboot. See, some books are considered classics. And classics are really only classics if they can be recognized with very little original context. Fairytales do this best: we see a wolf and so much as the color red and we know we’re seeing Little Red Riding Hood. Put together a clock and a shoe and we know it’s Cinderella. More recent classics can do this too, though. Dreary castles and dark capes bring to mind Dracula while practically every boy-and-his-dog story feels like a reference to Old Yeller. Little Women is a classic in that most kids started reading it when they were about 10 or 12 and at 16 discovered they could still relate to it. And at 25 or 35 or 45, discovered it all over again. It’s a coming-of-age story, a sisterhood story, a war story and one of those rare classics with a mostly female cast of characters. 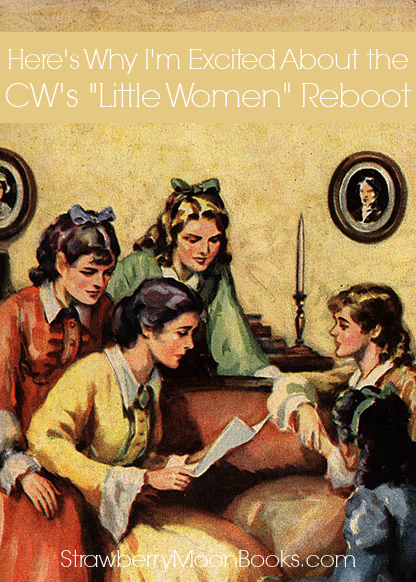 So the real question here isn’t whether the CW should be allowed to touch such a supposedly pristine piece of childhood ephemera, but rather, whether Little Women is enough of a classic to stand up to a reboot. Because let’s be honest. Little Women isn’t pristine at all. It’s set in the middle of a brutal war, one of the main characters dies a senseless death, and let’s not pretend we didn’t see the love triangle between Jo, Laurie and Amy. This isn’t just some heartwarming tale of friendship, as I’ve seen it called so many times over the last couple of weeks, although younger readers might perceive it that way. As we get older, we start to see the more adult elements of our favorite books and Little Women is certainly no different. As if the content of the story weren’t enough to dispel all of the negativity surrounding this announcement, Louisa May Alcott herself probably is not rolling over in her grave as so many people have claimed. In fact, Alcott was rather something of a badass feminist for the 1860s. She didn’t even want to write children’s books and her own desire to remain unmarried is supposedly why she refused to marry Jo off to Laurie, despite 19th century fangirls begging for that exact outcome. She was poor, she spent much of her life hungry, (until the publication of Little Women changed all that), and she wanted to write about women who could take care of themselves. So giving the girls some grit and some dystopian dirt under their nails, would probably make Alcott dance in her grave, not roll. So, yes, I am all for the CW’s ‘gritty, dystopian’ reboot of Little Women. Is it possible they’re going to screw it up beyond all repair? Entirely. But any time we can take characters, (especially epic female characters like Jo March), out of their original context, while still preserving the ability to recognize them, I’m there. As a bonus, if you’re in need of a refresher course before the show comes out, there’s a sweet little 1960s edition of Little Women available in the Strawberry Moon shop right now: Vintage Little Women Book. Also, for the record, the best theory I’ve seen so far as to why the girls are now half-sisters, is to mix up the diversity of the cast. Which could be pretty damn cool. Although the cynic in me guesses that if any of the sisters is most likely to be cast with an actress of color, it would be Beth. So what do YOU think? Is rebooting Little Women with a grittier premise a great idea or is our collective nostalgia for Alcott’s work just too strong?